One 10th of the way there! 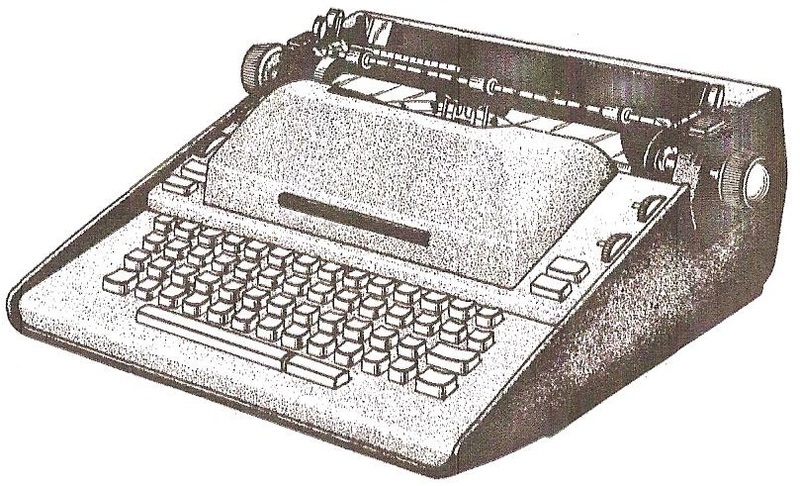 It’s probably fair to say that many of the typewriters – especially those designs which never left the drawing board – and the inventors we have highlighted in the “On This Day” series of posts may have held little or no interest for fellow Typospherians. I must confess I research these projects and the people behind them as much for my own erudition as anyone else’s. 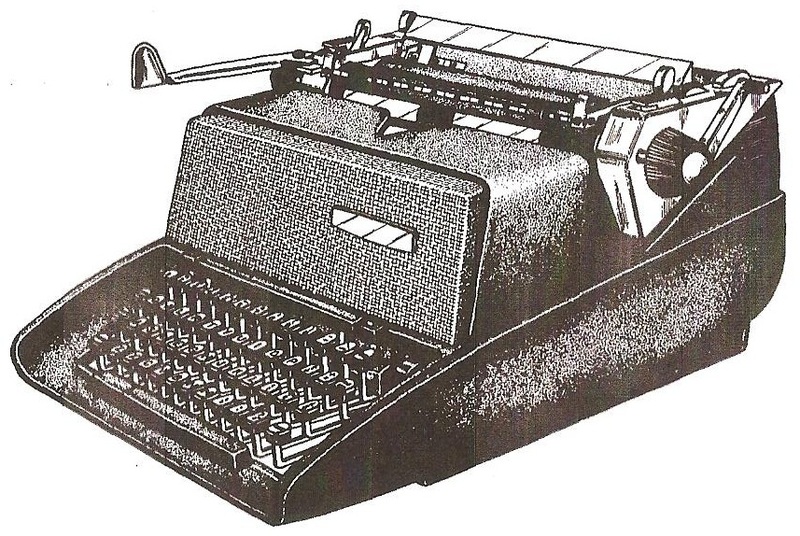 As I go along, I am trying to fill some of the huge gaps in my knowledge of the development of the typewriter. This especially applies to the later part of the 19th century. 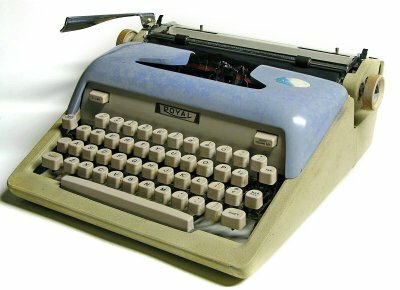 Let’s face it, once Franz Xaver Wagner had perfected frontstroke "visible" typing and the Underwood 5 came along, it pretty much put an end to the chances of any really significant subsequent advances in office machines. 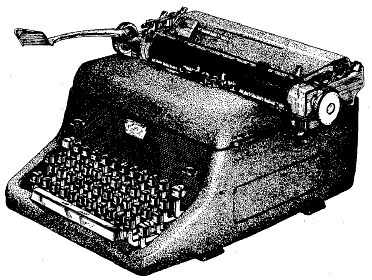 There were some developments in portable typewriters in the 20th century, but those also ground to a halt in the years immediately following World War II. And, to be blunt, beyond that time what we would be looking at are not so much inventors as designers. 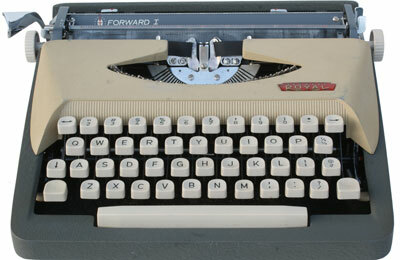 Still, these latter-day typewriters are the models with which Typospherians will be more readily able to identify. Like me, machines such as the Automatic are merely the stuff of dreams. We may look at images and wonder, but we may never be able to touch (let alone own). It’s also true that not much can be revealed in this series about late 19th century inventors and their machines which hasn’t already been written and published. So today, happily, we are offered an opportunity for something a bit different. 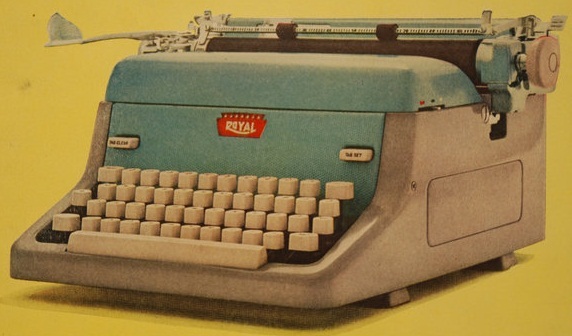 First, the range of typewriter models we are looking at includes machines that I know many Typospherians own, use and love: The late-1950s, early 60s Royal portables usually identified as Arrows, Parades, Royalites (second series), Futuras and Centurys. (The Royalites shown above come from the collections of Alan Seaver and Mr Martin). As well, the designer of these machines is a most interesting person in his own right. 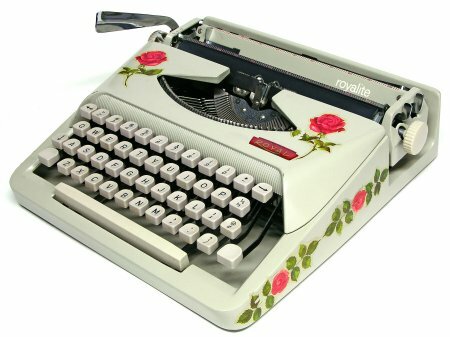 Let’s start with the typewriters. 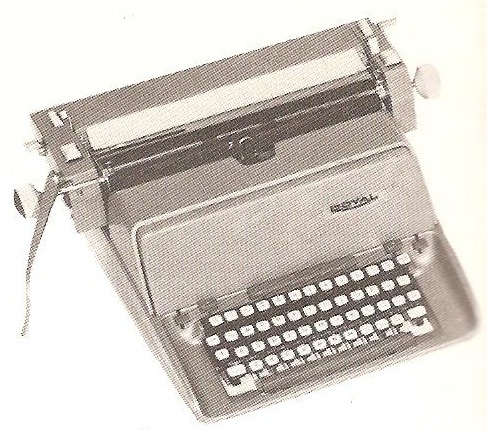 In 1945, Royal had the great industrial designer Henry Dreyfuss apply some cosmetic modifications to the Quiet DeLuxe, which had served it (and Ernest Hemingway) so well in the 1930s and 40s (The 1948 model is shown above). 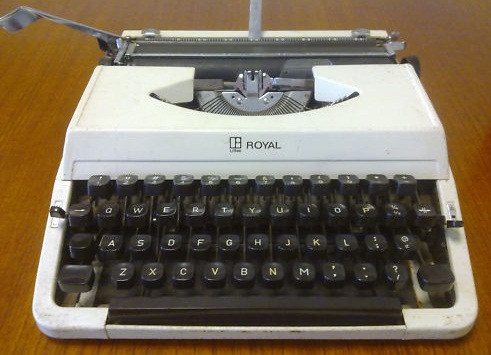 In 1953, Royal took over Dutch typewriter company Halberg and moved part of its operations to Leiden in Holland. 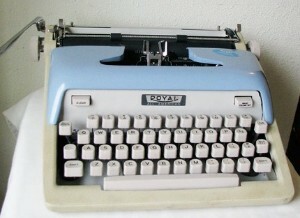 The Halberg-style first series of Royalites are unquestionably a very fine flat-profile portable (the example above is a gold-plated presentation model given to an Australian Royal-McBee executive). But in 1954 McBee got in on the act in a merger, and under this change the next generation of Royal portables was introduced in the US. Though the mechanics were barely altered, the outer housings presented a quite different, very stylish look. Finally, in March 1965, Litton Industries got its hands on Royal-McBee and eventually the entire works, including Imperial, shifted to Silver Seiko in Japan. Royal typewriters would never be the same again – although they were the same, the same as everything else Silver Seiko produced (below). 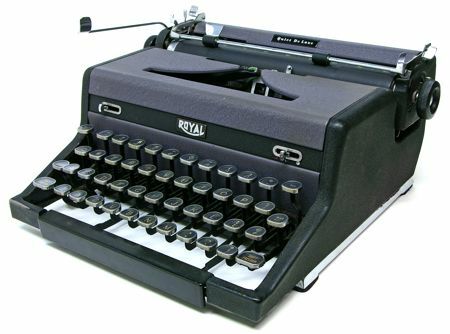 During the 10-year McBee period, the new breed of Royal typewriters, combined with McBee’s accounting and statistical machines and supplies, helped sales rise from $84.7 million to more than $113 million a year and Royal-McBee was consistently listed as a Fortune 500 company. 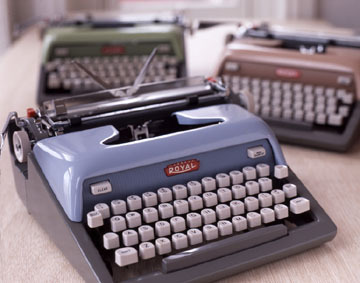 In December 1957, Royal produced its 10 millionth typewriter. By sheer coincidence, the middle name of the man who designed these Royal-McBee models was the same as that of Thomas Fortune Ryan, the multi-millionaire who in 1906 had financed Royal’s start in typewriter manufacturing. And for much of the time of all the changes in Royal’s structure, from 1951 to 1965, the company's president was Thomas Fortune Ryan’s grandson, Fortune Peter Ryan. But Laird Fortune Covey was no relation to the Fortune Ryans. Apart from his design work on the Royal-McBee typewriters (and many other things, including Stanley blades), Covey's other claims to fame are that his father was a noted American mural artist and his stepmother was the popular and prolific children’s book author and illustrator Lois Lenski (below). Laird Covey designed the housing for a number of Royal-McBee models between 1957-61. 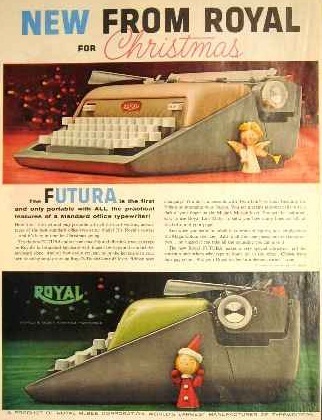 The first was the FP office machine. 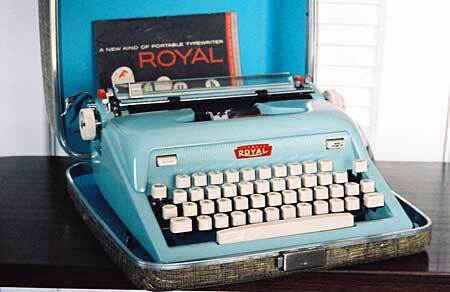 It was on this day in 1957 that Covey applied for the patent for his design of the upgraded Royalite (above). It was issued in March 1958 and in production the bottom section was extended as one piece to the back of the carriage. 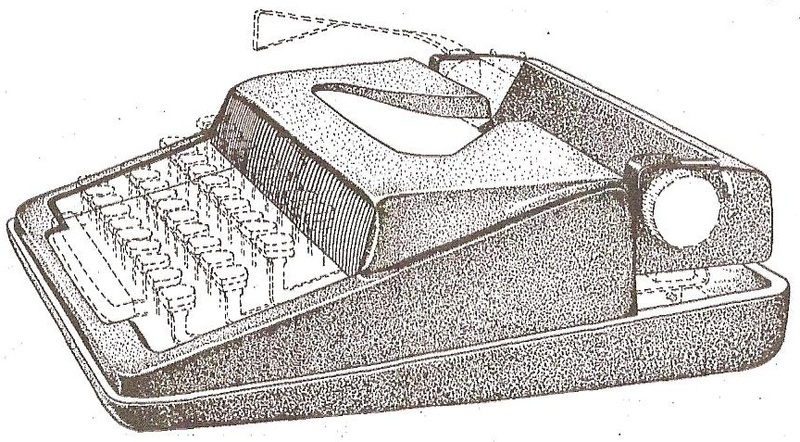 In his references, Covey acknowledged the influence of the Underwood Golden Touch Leader in his design, as well as a Regua adding machine. 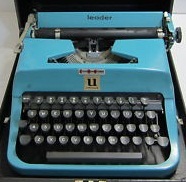 The Underwood GTL (below) and the Royals certainly share similar sloping lines. 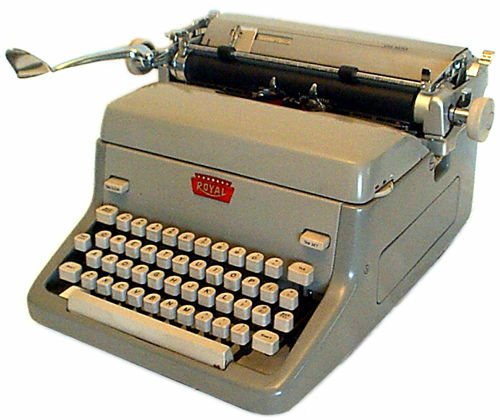 In 1960 Covey designed the Model 101 (below), as well a futuristic-looking electric typewriter which does not appear to have gone into production. 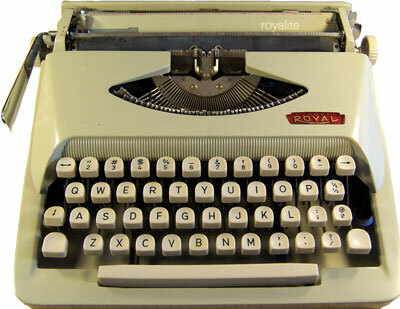 But Covey’s Royal-McBee designs, which follow a pattern with long sweeping lines up from the spacebar to the carriage and beyond, had a profound influence on the housing of typewriters from many other brands, right through to 1983. 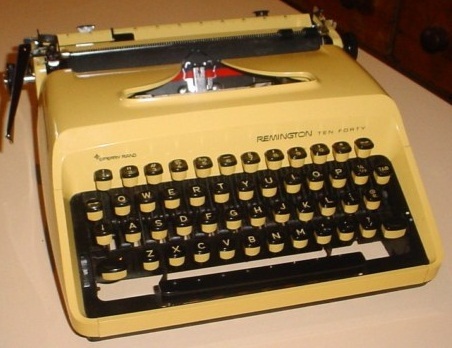 Among those who referenced Covey’s designs were Anton Demmel with both the SF and SM7 Olympias, Peter Sieber and Arnold Shurer with other Olympias, Richard H. Penney with the Remington Sperry-Rand Ten-Forty (Letter-Riter, above), David O. 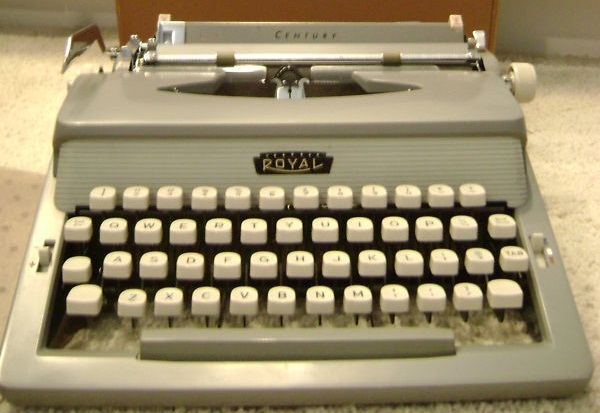 Chase and Philip A. Stevens with an SCM, Sears-Roebuck, a toy typewriter, Brother and Olivetti with electronic typewriters (the latter by Mario Bellini), and Carl Sundberg and Montgomery Ferar with later Royal designs. Even Eliot Noyes recognised Covey’s influence on the IBM Executive. Laird Covey was born on April 25, 1917, in Hobster, New Jersey. His father was Arthur St Claire Covey (usually called Arthur Sinclair Covey; the names are pronounced exactly the same way) and his mother was English-born Mary Dorothea Sale, who had meet Arthur Covey when they were both students of Sir Frank Brangwyn in London between 1905-08. Mary died in Bergin, New Jersey, the year Laird was born. Arthur Covey remarried in 1921, when Laird was four. In 1929 Arthur and Lenski had a son, Stephen John Covey. The Covey children were to inspire Lenski’s books, and later Laird and Stephen were to become joint copyright holders of her work. 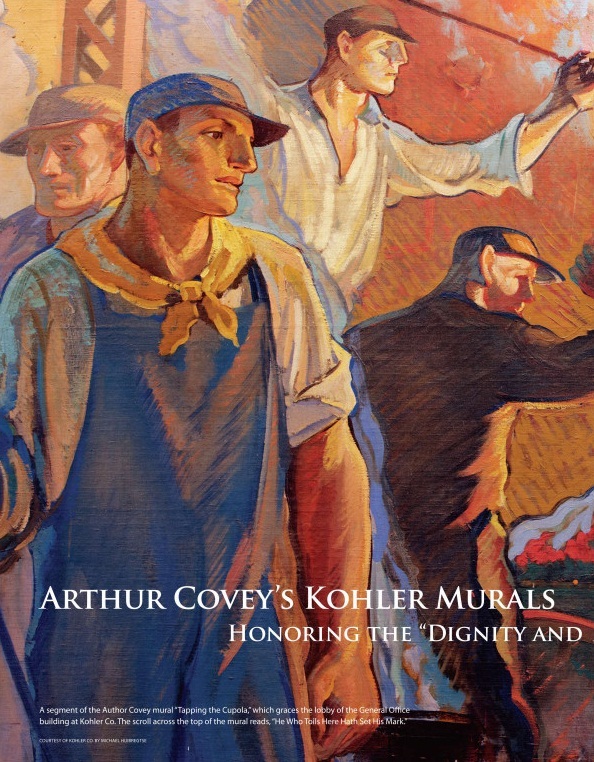 Arthur Covey’s best known series of murals is at the Kohler Company offices in Kohler, Wisconsin (above). Arthur Covey had dabbled in inventing in his younger days and his two sons, Laird and Stephen, were to work together on many design projects. Sadly, Laird’s designs for Royal-McBee came at a time when Arthur had become seriously ill. He died in 1960. Laird Covey attended Governor Dummer Academy in Byfield, Massachusetts, then the Rhode Island School of Design in Providence. He graduated in 1939 from Brown University in Providence and devoted most of the rest of his life to design work. 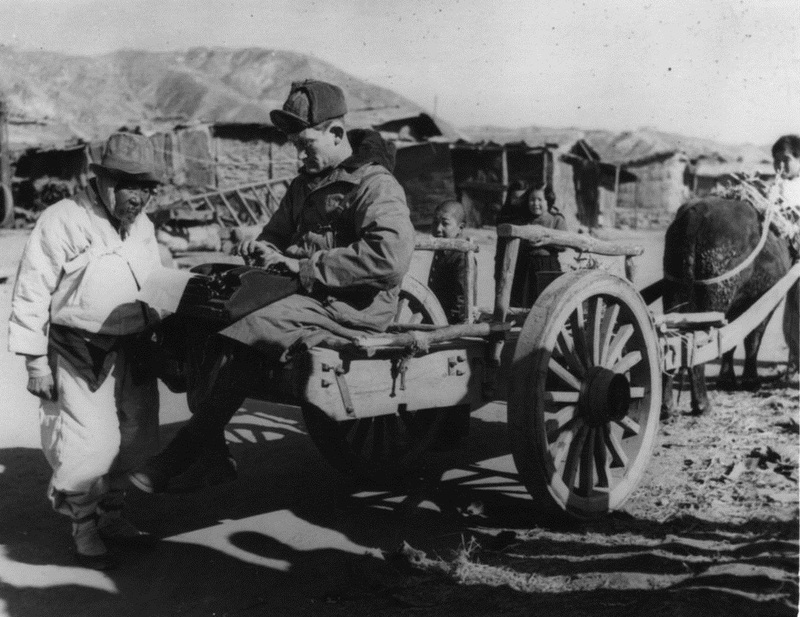 On this day in 1950, the Korean War began with the invasion of South Korea by North Korea. 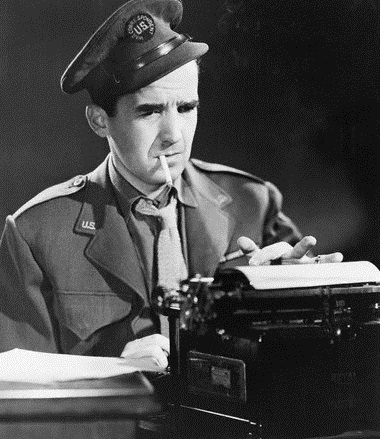 Below we see CBS war correspondent Ed Murrow in military uniform as he prepares to cover the conflict. And of course Marguerite Higgins, as always, worked under trying conditions in Korea. 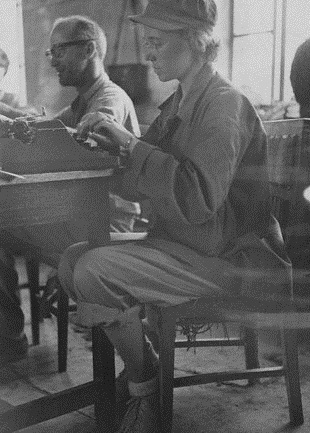 In this photograph, Higgins, of the New York Herald Tribune and the News Chronicle, is writing her report after visiting front line areas. However, as you have at least 305 left to go, I do look forward to your coverage of the machines we *do* have in our collections, if for no other reason than we often don't know much about the histories of our machines despite their relatively recent vintage. 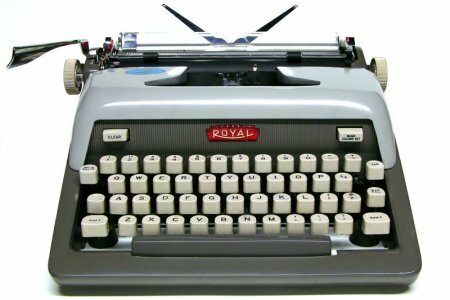 This Royal article warmed my cockles when you put up a pic of the '48 QDL (my personal favorite of the line and the only Royal I own), and learning a bit about who designed it is fun and does really speak to me as a casual collector. Hello , I worked at Stanley Tools, New Britain Ct., Divisional Product Engineering, in the late 80's and 90's. I was a CADD - Computer Draftsmen. Some of the Stanley Tool products were designed by Laird Covey - the classic '99 Knife, being one example. I do recall that his designs commonly featured very large arcs - on the order of 50" - 100+"! So that the 'old time' draftsmen would have to get string and tie a pencil to swing the arc on old paper / pencil drawings. On computers we did not face that problem. Stanley considered it quite a statement of pride that they managed to get Mr. Covey to do some design work on their products. 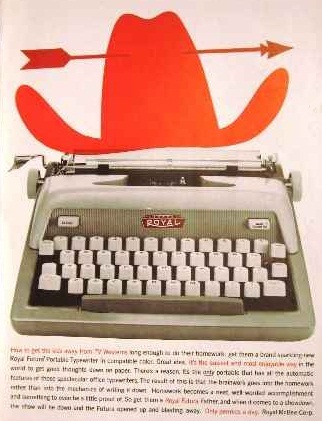 A Laird Covey design was an automatic statement of product style and functionality, with smooth blended curves and a nearly windswept appearance. Quite interesting to see his name on such a wide array of classic American products. Happy Father's Day, Papa Typospherians!